The Acropolis, Athens holds a group of monuments that have been influential from Antiquity to Neo-Classicism. 'Acropolis' means Upper City, although it hasn't been a city where people live since the 6th century BC. 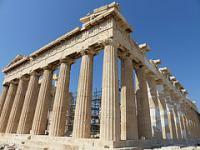 The monuments are situated on a 60 meter high rock that dominates Athens. Since the 5th century the Acropolis has city walls, turning it into a strong fortification. 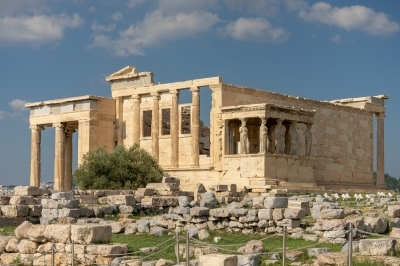 On top of the rock, some of the best monuments of Classical Greece can be found: the Parthenon, the Propylaia, the Temple of Athena Nike and the Erechtheion (421-406). They all date from the 5th century BC. In 2001, I visited the Athens Acropolis for the first time. I went on a Sunday morning. Entrance was free on that day of the week. I made no note of other visitors, only of being welcomed (or: slightly scared) by 2 stray dogs at the entrance gate. Last month I went back and witnessed what impact the surge in mass tourism has had: the entrance fee is now 20 EUR for this single site and you really have to coordinate your visit well to avoid queuing. I arrived at the gate at 7.50 am, 10 minutes before opening. This awarded me with spot #5 in the queue for the ticket office, where 5 people in a row just were getting started doing their repetitive work all day. This is not a kind of job that in Greece is replaced by machines quickly – although you can buy e-tickets. At 8 am the queue had grown to some 40 people. Two dogs also came over to have a look, probably not the same individuals that I encountered 17 years ago! I was one of the first persons at the site that day and on my way up I even met the party of soldiers that hoist the national flag there each day. 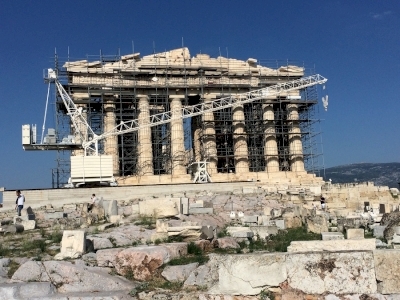 The Parthenon is a massive structure, still with scaffolding covering most of its interior. This has been the case for a long time and will go on until 2020 at least. The effect is that you can only walk around it. The other monuments on the plateau are not accessible either (except from the Propylaea via which you enter): this does take something away from the visiting experience. Walking down via the South slopes you’ll pass more ruins with great historical value but which aren't the best remaining examples of their type that can be found in Greece. A fairly recent addition (re-placement) is one of the poet's statues that adorned the way to the Theater of Dionysus. The New Acropolis Museum lies just outside the South Gate, near the Theatre of Dionysus. It is an impressive modern building, the entrance costs a reasonable 5 EUR. There is a strict ‘No photography’ policy here, which came as a surprise as I was able to freely take pictures of about every single object in the excellent National Archaeological Museum of Athens the day before. The Museum has 3 sloping floors of exhibits. The lower ones I found ‘more of the same’ after having visited the National Archaeological Museum. At the top floor they have a reconstruction of the full Parthenon frieze: “From the entire frieze that survives today, 50 meters are in the Acropolis Museum, 80 meters in the British Museum, one block in the Louvre, whilst other fragments are scattered in the museums of Palermo, the Vatican, Würzburg, Vienna, Munich and Copenhagen”, according to the museum’s website. What I liked best however are the 5 original remaining Caryatid statues that have been saved from the Erechteion. The 6th is in the British Museum. The ones now present at the Erechteion on the Acropolis are replicas. I am a bit in doubt whether I should adjust my rating for this WHS. As a visiting experience the Athens Acropolis is somewhat disappointing – I found so this time and that was what I remembered from my previous visit as well. There’s no doubt about its universal value of course. I had rated it 4 stars before (an ‘8 out of 10’ in my own conversion table), a lower score already than given by the average community member. Somehow it feels less ‘grand’ than the Ancient Egyptian temples at Luxor for example, where you can freely roam around and much more is left in situ. For many years, Greece was at the top of our travel bucket list. Specifically, we wanted to go to Athens to see the Acropolis and the Parthenon. The economic downturn hit Greece hard and we put our plans on hold. But dreaming became reality in 2017. Athens is everything we thought it would be. There is so much history around every corner, but nowhere is more impressive than the rocky outcrop of the Acropolis, the UNESCO World Heritage Site in the center of the city. Over 3,000 years ago, this massive rock became the religious center of Ancient Greece. And at the center, the Parthenon stands over the city. This temple dedicated to Athena was completed in 438 BC and much of the Doric structure still stands today – albeit under scaffolding. We were shocked to learn that Greece started the preservation project in 1975 and it is still going to this day! One of our favorite things to do in Greece was to sit in one of the cafés at the bottom of the Acropolis and look up at it illuminated at night. The building is just so beautiful. We’re not museum people, however, we were really pleased we visited the Acropolis Museum at the base of the rock. All of the important artwork from the Acropolis that wasn’t looted is now preserved here. There are sculptures and friezes, but we were shocked to see the number of vases, figurines and other artifacts that were discovered at the site by archaeologists. I always find myself awed by grandiose edifices. Beholding the Parthenon up close, unfailingly grandiose despite its ruined state blended with a construction site, made the visit to Acropolis instantly worthwhile. The 5th century BC temple dedicated to Athena, the patron of the city, is nowadays no more than an empty shell, and nonetheless still a signature piece of Doric architecture. Acropolis is not just about the Parthenon. There is the Erechtheion, just a few decades younger than the Parthenon, with the eye-catching Porch of the Maidens; several smaller temples; two theaters; and other assorted historic remains. The new Acropolis Museum, which is less than 10 years old, sits underneath the Acropolis hill near the southern slope and is not part of the World Heritage site. It requires a separate fee to enter and undoubtedly has a lot to offer, but I chose to leave it off our itinerary. The Acropolis treasures that currently reside in the British Museum in London – where I saw them several times during my years of living in the UK – are a gaping hole in the museum’s collection, and the Greek government have been waging an understated battle for over three decades now to have them returned to their rightful home. When they are returned to Greece, the museum will become an essential companion to the World Heritage site. My visit took place in July of 2018. Acropolis is the focal point of Athens, unmissable if you spend any time in the city. Ticket lines can get pretty long in the middle of the day, so either come right before the opening or wait until 5pm or so; only right after the opening and right before the closing time will you have a chance of not sharing the site with hundreds of other tourists. Of the two main entrances, the southern one has shorter lines at all times of the day. Minimum of one hour is needed to see all there is to see; if you let the awe overtake you, it could be quite longer. 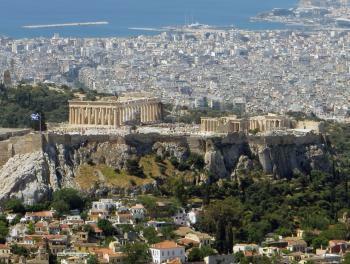 The monuments of the Acropolis stand out majestically amidst the Athenian skyline from the summit of Mount Lycabettus. I visited Athens in spring 2013, and thoroughly enjoyed my time at the Acropolis. The partially damaged Parthenon was spectacular to see up close, but I also liked the other ruins on the plateau, including the Propylaea, the Erectheion, and the Temple of Athena Nike. Additionally, on the climb to the Acropolis I passed by the Aeropagus, or Mars Hill, where the apostle Paul addressed the Athenians in the 1st century AD. Two stories I heard about the German occupation of Athens during World War II illustrate the significance the Acropolis maintains to modern Greek identity. One was of a Greek soldier ordered to remove the large Greek flag from the flagpole on the Acropolis in April 1941; the soldier reluctantly complied, wrapped the flag around him, and jumped off the plateau to his death. A few weeks later two Greek youths snuck into the Acropolis and tore down the Nazi flag, inspiring Greek resistance during Axis occupation. Our trip, in February 2015, gave us two and a half days, which turned out to be quite sufficient for seeing the city’s main sites, both WHS and not. It was interesting walking past Syntagma Square to see the protesters with their banners decrying Angela Merkel for her insistence that the Greeks continue to walk the path of austerity. Athens offers a very reasonably-priced ticket that for €12 allows you entry to ten different sites, including the Acropolis. Walking up to the Acropolis from its south slope we passed the Theatre of Dionysus. This open-air theatre was dedicated to the god known to the Romans as Bacchus – the patron of wine and drama. It was in this theatre that the works of Sophocles and Euripides would have been premiered, and you can still sit on the marble benches. It was quite an amazing place to be. In addition to the Parthenon, the summit of the Acropolis houses several buildings. They include the Erechtheion, a temple dedicated to Athena and Poseidon. One of the most interesting features of this building is the Porch of the Caryatids, in which six supporting columns were sculpted in the shape of female figures. The Parthenon itself is not just a pretty building – it has been central to the identity of Athens for dozens of centuries. UNESCO cites the Acropolis as being “the supreme expression of the adaptation of architecture to a natural site”. The newly-built Acropolis Museum stands near the foot of the hill, in which are housed various statues found across Greece but particularly in Athens and on the Acropolis. The highlight is on the top floor, where you will find one half of what we in Britain call the Elgin Marbles. Also worth a visit is the National Archaeological Museum - it is really the archetypal classical museum: chock-full of marble statues and other artifacts from across the Hellenic lands, including the enigmatic Antikythera mechanism. I visited this WHS in June 2014. Although touristy, I really enjoyed my visit and spent a half a day exploring different point of views, buildings, remains and museums included in the 12e entrance fee. Apart from the Parthenon and the Erechtheion with the Porch of Caryatids, I enjoyed visiting the Odeon on the South slope and the surrounding hills, each with a spectacular panoramic view of Athens. I particularly enjoyed visiting the Ancient Agora which is pretty much intact and well worth a visit. When we arrived in Greece, we were informed that we had to see the Acropolis right away because they were going to close it for several days for repair. Despite being very tired after a long flight, and hot since it was in August and we didn't have time to change into cooler clothes; we were excited to see these incredible ruins! The Parthenon was laced with ladders and supports but it was still awesome. To imagine how old it is and how long it has survived, was amazing. Much of the deterioration you see is a result of different countries taking pieces of the monuments years ago. this pilfering was apparently common long ago. The area is large and spread about. There is a lot to take in and the time passed quickly before closing. We were able in the following days, to visit the Ancient Agora and the Theatre of Dionysius , the Temple of Zeus and the Temple of Poseidon. There were so many old structures that I wasn't sure why more were not included as World Heritage sites. Athens held a wealth of history and old architecture. It is a place where you can easily spend several days exploring. ACROPOLIS... a must to see. although it is under renovation at this time. nevertheless, it is an amazing place! You could see the whole athens on top of this old city rock. It is quite an experience to visit the place. We visited in June 2008. We were there around 08:30 and it was already hot and busy! Fantastic site, but didn't expect all the building work. The new museum was in soft-opening mode and should be amazing when fully open. I really enjoyed the Acropolis when i visited it this past winter. This site, out of all of them, helped me incredibly. I made sure I got a tour guide, and got up to the top early in the morning. Thanks to Eric for that! I suggest everyone visits this world heritage site, and sees what exploration is all about. I love my life, and now that I am exploring the world, I have a purpose. I felt a bit sentimental walking through the Acropolis, as my dad had been there when he served in the US Navy some 30 years before I went. I looked through some of his old photos and saw one of him squatting in front of the Parthenon. I copied his pose and had a photo taken of me in front of the Parthenon. I was also enchanted by the caryatids (pictured above), which I studied in my high school humanities class. It was stinking hot when I went so if you are going in the summer, be sure to have a hat and sunglasses; you'll need them! I also recommend the nearby Dora Stratou Theatre to watch some traditional Greek dancing! HEY, i loved all your useful tips. Thanks Eric Hamblett, the tour guide really helped. I travel the world quite a bit, and I have developed a large passion for World Heritage Sites. Nothing pleases me more than to have ancient ruins to visit, and cherish. Evermore, my passion grows to this day. My advice would be to stay in the city, where there is more going on. Thanks for creating such a wonderful site. My religous courses and your guidance helped to achieve perfect satisfication. Athens is an amazing city and I hope to one day visit again. The Acropolis is beautiful especially the great views from above. During the summer months, Whenever I travel, I make sure I check your site to see if there are any World Heritage Sites around the area. The Acropolis is one of the best cityscape vantage points I've ever seen. Looking down on Mars Hill, a.k.a. the Areopagus, I could just image the apostle Paul addressing the gathered Athenian intellectual community. As the seat of an influential world empire, this site in the heart of Athens gives one real perspective and meaning behind the Greek contributions to the world. Athens is an interesting city and much less dirty, crowded, and noisy than most people seem to believe, but its attractions are few and far between (great archaeological museum, though). The one exception, though, is of course the Acropolis. It can be seen from almost everywhere in the city and is probably the greatest surviving ancient monument anywhere. Its WH listing says that it symbolizes the idea of world heritage, and that's certainly true. Not only its architectural, cultural, and historical significance is enormous, but it can also be considered to be the birthplace of democracy. So walk up the hill (not very strenuous), enjoy the view, see the temples and the museum, and be aware that everything that makes Western civilization unique started from here. An unmissable and unforgettable experience. The Acropolis was one of the most wonderous places I have visited in a long time. The site is being preserved, and you cant go into the parthenon. But, nonetheless, all the other amazing attractions still captivated my attention. Traffic can be a problem, so I reccomend hiring a guide, or a tour which will take you on the bus. Visiting the classical of all classical World Heritage Sites – The Acropolis of Athens - could not have been a better for me. Having got up early on a bright and sunny Saturday morning in July, I was rewarded with an almost empty town - still in its morning slumber yet to wake up to a new busy day. From my hotel near the Omonia square I walked pass the fish market, where the smell of fresh fish told that new day of commerce was just about to begin, down to the Monastraki square where only one or two of the many souvenir shops had yet opened their doors. Before walking up the Acropolis hill I sat myself down on one of the many outdoor cafes in Plaka and ordered a cold cappuccino, a quite a popular drink all around Greece I later found out. But I guess anything that is COLD in a country where it’s usually +35 half of the year is highly appreciated. Walking up the hill did not prove to be as exhausting as many of my friends had told me. The recommendation to be early proved to be hundred percent correct though. Even if I arrived at the entrance at quarter passed eight in the morning on a Saturday, it was still quite a number of tourists already in place. To avoid them as much as possible I quickly walked up the last bit to the magnificent entrance of the Acropolis - the Propylaia - and soon found myself looking at the magnificent Parthenon, the largest Doric temple ever built in Greece, completed in 438 BC. 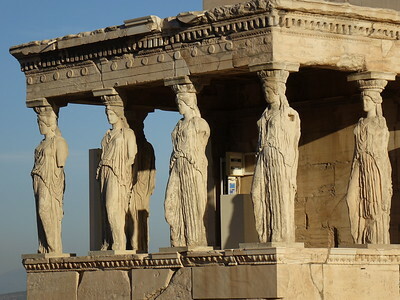 Together with the small Erechtheion temple where the four Caryatids (the four women statues) are holding up the temple is an absolute classic place and a visit that every man and women ought to do once in their life. The Parthenon is currently undergoing some extensive repair and refurbishing and considering that it’s actually not time and age who has eroded the temple, but rather a large explosion back in the 17th century, it’s quite OK in my opinion. But other attempts, trying to enhance or re-construct ancient temples, is quite a nuisance and should in my opinion be forbidden and just turns historic sites into Disneylands. But on the hot issue of whether Parthenon’s famous frieze should be returned by the British Museum to Athens, the answer is quite obvious when you stand in front of this enormous and beautiful temple - there is no museum in the world that could do justice to the original site, specially not the Acropolis of Athens. It was so exciting. I loved Athens. I will definitely visit again! Your website made it possible for me to find info before I left which was extremely helpful. Asklepieion: The Asklepion was situated on the South slope of the Acropolis - "founded in the end of 5th century BCE by a man named Telemachus, who brought the cult of the healer god in Athens from Epidaurus. The place where it was built was selected because there was a small spring, very essential element for the cleaning of the patients.The sanctuary consisted of a the small temple of Asclepius and two stoas. The one was Doric and two-storied. This was used as an infirmary. It was called enkoimeterion (the place where someone sleeps) because there slept the patients waiting to see the god in their dream, giving the advises for treatment or to cure them. A second smaller ionic stoa could be found westwards. It had four rooms in which the various visitors resided. The sanctuary was destroyed in 267 CE by their Heruli and later on, was replaced by a Christian basilica dedicated to the Saints Anargyri, not by chance, as they are considered protectors of health." Earls of Elgin: The 7th Earl of Elgin (1766-1841). He was British Ambassador to Constantinople 1799-1803. Broadly interpreting the authority he had been granted by the Ottoman authorities he arranged for the removal of the Parthenon marbles between 1801 and 1812 (together with parts of the Propylaea and a Caryatid from the Erechtheum). He ultimately sold them (at a loss to himself) to the British Government who placed them in the British Museum where they controversially are to this day. Lord Byron: Lived in Athens in 1810. Opposed Lord Elgin's removal of the Parthenon Marbles and wrote "The Curse of Minerva" to denounce Elgin's actions. Mosques converted from churches , cathedrals or synagogues: Parthenon was used as a Christian church from the 6th century, and turned into a mosque between 1456 and 1687. Built elsewhere as a full size replica: The Parthenon. Built in Nashville TN USA. Originally constructed in plaster, wood and brick in 1897 as part of the Centnennial Tennessee Exposition. It was rebuilt 1902-31 in concrete and a full size replica of the statue of Athena Parthenos was added in 1990. The building is used as an art museum. Reduced from broader TWHS: TWHS originally included hellenistic, Roman and Neoclassical monuments of Athens. 525 Community Members have visited.